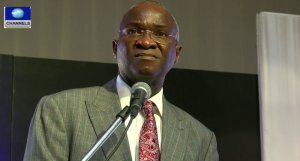 Nigeria’s Minister of Power Works and Housing, Mr Babatunde Fashola, says there is currently not enough power to distribute unless more turbines are switched on. He attributed recent power outages in some parts of the country to four turbines which stopped working, but hoped electricity supply would be stabilized soon as three of the four turbines have been restored. The Minister also expressed hope that President Muhammadu Buhari’s 10,000 megawatts target would be met. He, however, decried acts of vandalism which he says is causing some of the energy problems in the country.